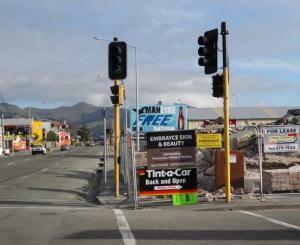 Corner Cashel & Barbadoes Streets, site of the old hotel. The footpath has been blocked for months and really needs to be cleared. The people who are clearing the hotel site need to move all their rubbish off the path. Forcing pedestrians onto the road is not very safe. In addition cyclists need to use this path to go north because CERA continue to keep Madras St closed. They cleared the footpath at last. Only took a year for them to do it and 6 months from first reported.